Mumbai based startup Kredence Enterprises Pvt Ltd, founded by Ketan D. Raiyani, has launched a group buying site called GroupByte.com for consumer electronic products, computers and automobiles. Kredence was founded in October 2009 with a corpus of around $0.5 million by Raiyani shortly after he exited his previous venture Taxsmile.com India Pvt Ltd. He had founded Taxsmile, an online tax filing site in September 2005, and exited it in favour of software products company 3i Infotech Ltd. At the time of his exit, the website had 3 lakh users and tolled 50,000 online filings. Now, Raiyani is using Kredence to launch a portfolio of companies, the first of which is GroupByte. He also has plans for Healthion.com, an online healthcare website and two more B2C sites. GroupByte will focus on consumer electronics, computers and accessories, auto companies, and will also add home appliances such as TVs, air conditioners and computers by next month. "We saw that there was no portal catering to planned purchases and decided to start one," Raiyani, Founder, Kredence, told Techcircle.in. "When a few friends wanted to buy a car, we realised that individuals succumb to MRPs since there are corporate discounts but no individual discounts being offered on big ticket items such as these." Currently the site offers five categories of products â€“ televisions, mobiles, air conditioners, computers and accessories and automobiles. According to the company, it will also offer real estate, cars, high-end electronics and white goods, gadgets and gizmos, fashion and lifestyle products, travel packages and watches. Brands are excited about e-commerce, said Raiyani. The company has directly partnered with 8-9 national and international brands and plans to add 30 more by the end of the month. Kredence will leverage the pan- India distribution centres of brands to ship products directly to users. "Most brands have facilities for institutional sales which will be leveraged for shipping," said Raiyani. A user visiting Groupbyte.com will be able to pick and choose products and add them to a 'wish list'. 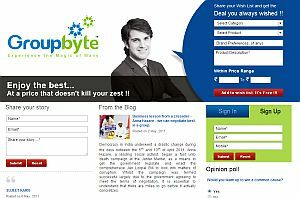 Groupbyte.com will then negotiate a discount on the products from the vendor, depending upon the number of users who have selected the product in their 'wish list'. The wish list generated at Groupbyte will replicate clearance sales channels from the vendors' perspective, said Raiyani. Soon, the website will introduce a 'Bargain Corner', where user's demands will be sent anonymously to vendors. Users currently have the option to submit their choice of a product amongst the five categories and the price range they are willing to pay. There is no information that will allow a consumer to make the right choice, no comparison shopping nor is there a real-time look at discounts according to the number of online users opting for a particular product such as is being used by Buytheprice.com. "Pre-negotiated deals depending upon volumes will be introduced in the future," said Raiyani. GroupByte.com will also attempt to port the group buying model to larger appliances such as washing machines and air conditioners. Currently, other daily deal sites in India offer discounts on services such as spa treatments, travel bookings and mobile handsets but have not introduced home appliances and large ticket items such as consumer electronics for homes. Raiyani aims to reach a volume of 50 transactions per day in the next 90 days. There are many e-commerce sites and aggregators in the daily deals segment in India â€“ Groupon India, eBay India, Snapdeal.com, Dealsandyou.com, Mydala.com, Koovs.com, Naaptol.com, Groffr.com, Timesdeal.com and Deal Ho Jaye by Rediff. Larger retailers such as Tata's Croma chain of stores and Future Group's Futurebazaar.com are also bullish on online sales this year. Raiyani counters that they typically focus on their inventory and will not offer negotiation nor a group buying benefit for users. Raiyani says there are a couple of websites similar to Groupbyte.com in China and the USA. Kredence will also expand its operations to 6-7 cities where there are large vendors present. Kredence plans to launch another website HealthiON.com in a couple of months. "Healthion will offer a comprehensive look at internal collaborations within the healthcare industry and power transactions for users, so they will be able to fix appointments with doctors, for example, online. It is a connected healthcare platform," Raiyani explains. It will also launch more Internet B2C sites in the future. Raiyani has identified two other opportunities and says the company will take a portfolio approach to launching the sites. "We will use the Internet to connect consumers wherever there is a large gap between service providers and users," he says.